Pippa continues making wonderful images with paint and pen and keyboard (Margaret and I cherish her email messages). 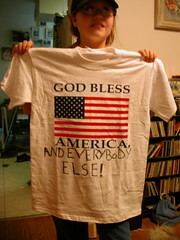 At F2C, Dave isenberg brought out a t-shirt he'd been given by his print shop; it read in big letters, "God Bless America," with an American flag imprint. He reckoned that the clergy delegate was the right conferee to get the shirt, so he threw it out to me. (This story does get back to how proud I am of Pippa.) I sat with the shirt displayed beside me through Thursday's program, and brought it home, uncertain of what should become of it. When I explained the situation to the family, Pippa quickly pointed out some of the theo-political problems with the shirt; her first reaction was that it should be a prayer, but that instead it reads as a command. But she volunteered to take it, perhaps to wear inside-out or use for her painting shirt. Fifteen minutes later she came back. . . .
Great dad begets great family. Usually. Thank Chris Rock for this one entering the collective consciousness, via his very funny political satire Head of State. Throughout the movie, the incumbent President kept saying, "G-d bless America, and nobody else!" During the final Presidential debate, Rock does a great riff and ends, "G-d bless America, and EVERYBODY else!" observing that G-d has indeed blessed America. Joi Ito - "AKMA boasting about his family" by Joi Ito is licensed under a Creative Commons Attribution 4.0 International License.